As jock-hating nerds and fun-loathing comedy snobs, there’s nothing we here at The A.V. Club look down our noses at more than March Madness, unless it’s nationally broadcast party game host Jimmy Fallon. But while we could (and, at some point, probably will) fill whole paragraphs with some well-aimed, only slightly hectoring screeds against the blinding worship of college athletics, Fallon’s genial mugging, and the apparently unavoidable human need to shove all of life’s conflicts into firmly regimented brackets, Fallon’s recent and devastatingly effective counterargument to our asthmatic vitriol is a little bit simpler: PUPPIES! 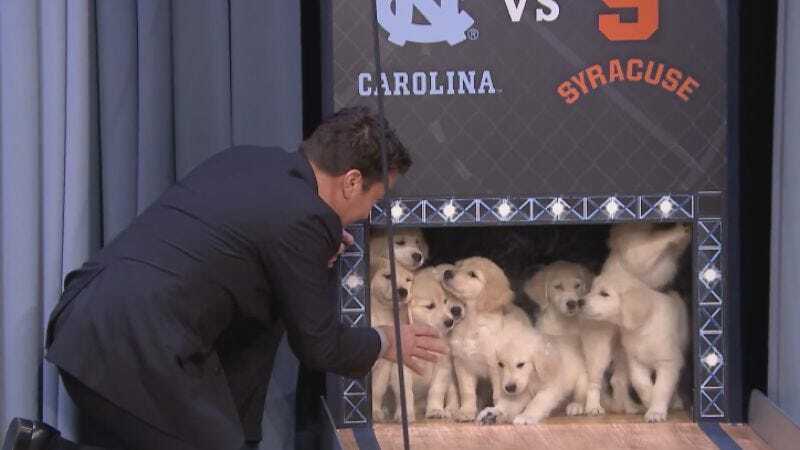 Yes, it’s the return of The Tonight Show’s Puppy Predictors, in which our higher brains are short-circuited by the spectacle of very, very cute dogs. This time, Fallon is picking the winner of something called the Final Four—presumably a reference to Battlestar Galactica—via the tried-and-true method of seeing which bowl the dogs will eat out of while they’re busy being good girls and boys. Such good girls and boys. Who’s a good girl and boy? It’s them. Anyway, apparently North Carolina is the final Cylon, as revealed by the antics of the hungry puppies—named, in what we’ll admit is a pretty good gag, with adorably boring handles like “Brad Johnson” and “Gary Frick Jr.” You win this round, Fallon (and/or organized sports).